“Then He went down with them and came to Nazareth, and was subject to them, but His mother kept all these things in her heart. And Jesus increased in wisdom and stature, and in favor with God and men” (Luke 2:51,52).The season is changing; the air is crisp and cold. Thanksgiving day has come and gone. Our thoughts are now turning toward an event which we love to celebrate, and which we often feel is coming too quickly. Preparation for Christmas can involve such a welling up of affections that sometimes maybe we wish it could not be so often we wish it could be a time even more rare and precious, not ever coming close to being usual or taken for granted. Perhaps parents especially feel the tenderness associated with the birth of the infant Lord. The innocent sphere that can come with Christmas reminds them of their own children and the innocent sphere that they have brought into the home. Thinking of children like this of babies and innocence it is never too early to turn our thoughts to the event of the Lord’s birth. Think of the infant Lord in His humble beginnings. As we prepare for Christmas, we begin to decorate our homes in anticipation and preparation. We set up our Nativity scene, carefully placing the baby Jesus in the manger or allowing one of our children to do this honor. But always we place near Him, standing over Him, Joseph and Mary, and then our image of the holy family is complete. Let us think about the earthly parents of the Lord while He was in the world, Mary and Joseph. In what sense were they His parents? Usually when we think about the Lord as He was when He was in the world, we think about Him as the Divine Man whose Father was within Him and whose mother was the church. The Lord said to the multitudes, “Whoever does the will of My Father in heaven is My brother and sister and mother” (Matt. 12:50). We know from the new revelation that our God is not a family of persons, Father, Son and Holy Spirit, three persons who are one in purpose. The Lord is one Divine Person in whom is the Father, Son and Holy Spirit as He is understood by humankind. As for us, and our true parentage, we know that the Lord is our heavenly Father, our true Father. And the church within each one of us, the dwelling place of the Lord in our hearts which gives us spiritual food and drink, the affection for truth which leads to goodness of life this is our true mother. What can we learn from Joseph and Mary as parents? In the letter of the Word, Joseph is identified as a parent to the Lord. The crowd around Him said, “Is not this Jesus, the son of Joseph, whose father and mother we know? How is it then that He says, `I have come down from heaven’?” Jesus lingered behind in Jerusalem when Mary and Joseph had left for Nazareth, and they found Him only after three days of searching. At that time Mary said, “Son, why have You done this to us? Look, Your father and I have sought You anxiously” (Luke 2:48). Now there stood by the cross of Jesus His mother, and His mother’s sister … When Jesus therefore saw His mother, and the disciple whom He loved standing by, He said to His mother, “Woman, behold your son!” then He said to the disciple, “Behold your mother!” And from that hour the disciple took her to his own home (John 19:25). Also, at Cana, “the mother of Jesus said to Him, `They have no wine.’ Jesus said to her, `Woman, what does your concern have to do with Me? My hour has not yet come. '” (John 2:3,4). From the beginning, the Lord brought comfort to Joseph and Mary, because they did not know what was happening to them. In the Gospel of Matthew, we are told that Mary was found to be with child, and that Joseph did not know what to do. He was a just man, and “not wanting to make her a public example, was minded to put her away secretly.” Immediately he was made aware that this was not what he had thought, but that it was a holy event. The angel of the Lord appeared to him in a dream, and said, “Joseph, son of David, do not be afraid to take to you Mary your wife, for that which is conceived in her is of the Holy Spirit. And she will bring forth a Son, and you shall call His name Jesus, for He will save his people from their sins” (Matt. 1:20,21). Joseph was comforted, and waited for the birth of Jesus. Mary, too, was afraid, and did not understand at first what was to happen. The angel appeared to her, and declared that she would conceive and bring forth a Son, Jesus. “He will be great,” the angel said, “and will be called the Son of the Highest.” But Mary, a virgin, responded by saying, “`How can this be, since I do not know a man?’ And the angel answered and said unto her, `The Holy Spirit will come upon you, and the power of the Highest will overshadow you; therefore, also, that Holy One who is to be born will be called the Son of God. '” And she was told that “with God, nothing is impossible.” So Mary was comforted, and she said, “Behold, the maidservant of the Lord! Let it be to me according to your word” (Luke 1:31-38). So Joseph and Mary were given a role to play in the fulfillment of thousands of years of prophecy concerning the Lord; they were to be the parents on earth who would care for the Child, the Messiah. Can we see parallels here for all parents? When a married couple first learns that the wife is with child, so often there is a sense of awe and wonder. For all their knowledge and training in the matter, there can suddenly be a sense that they do not know what is happening to them. There can be a real feeling that they are sharing in an event that seems beyond them as individuals and as a couple. 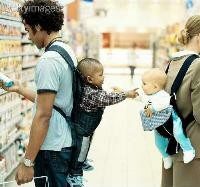 The creation of a new life is taking place with their participation, through their love for one another. And they will have a new role to play, as parents to the helpless newborn. Since … it was God who descended, and since He is Order itself, it was necessary, if He was to become a man actually, that He should be conceived, carried in the womb, born, educated, acquire knowledges gradually, and thereby be introduced into intelligence and wisdom. In respect to His Human He was, for this reason, an infant like other infants, a boy like other boys, and so on, with the sole difference that this development was accomplished in Him more quickly, more fully, and more perfectly than in others (TCR 89). This is clear in the letter of the Word, too. In Luke we read these words about the Lord growing up in Nazareth: “And the child grew and became strong in spirit, filled with wisdom, and the grace of God was upon Him. And Jesus increased in wisdom and stature, and in favor with God and men” (Luke 2:40,52). So we see that the Lord was born, yes, with a soul or inmost that was the Divine itself, but into a frail, infant human body and mind, which had to grow and develop under the guidance and protection of Joseph the carpenter and Mary his wife. After the wise men had come to see the baby Lord, Joseph was warned in a dream to “take the young Child and His mother, flee to Egypt, and stay there” until the threat of Herod was no more (Matt. 2:13). This protected the Lord from harm, because as a Child He was helpless, and very much needed the protection of the heavens through the diligence, perseverance and parental care of Joseph and Mary. Also, the Lord’s growing in intelligence and wisdom is represented by His being taken to Egypt (AC 1462). It is a picture of what all parents are to do: protect their offspring from harm, especially from the harm that the hells can inflict on the innocent. Parents are to flee to Egypt with their child. Egypt in the good sense means knowledge and human wisdom (ibid.). Parents educate their children and familiarize them with the ways and wisdom of the world as well as the Word so that they may be able to judge for themselves one day. This, too, is for the protection of the helpless. The love of parents for their children is very strong. In the work Conjugial Love, we learn of two universal spheres which proceed from the Lord: the sphere of procreating and the sphere of protecting what is procreated (CL 386). It is especially true with the love of infants. “The sphere of the love of infants is a sphere of protection and support of those who cannot protect and sustain themselves” (CL 391). Innocence flows into infants, and through them into parents, into their very souls (CL 395, 396). This is true parental love. It is a wonderful thing, and we are told in the True Christian Religion that this parental love in inspired in parents by the Lord Himself (TCR 457). How much more would the Lord inspire such a caring, self-denying love in those who would care for Him in the world, in those who would gaze on the face of the Holy Child Himself who was given into their hands? Now so it was that after three days they found Him in the temple, sitting in the midst of the teachers, both listening to them and asking them questions. And all who heard Him were astonished at His understanding and answers. So when they saw Him, they were amazed; and His mother said to Him, “Son, why have You done this to us? Look, your father and I have sought You anxiously.” And He said to them, “Why is it that you sought Me? Did you not know that I must be about My Father’s business?” But they did not understand the statement which He spoke to them (Luke 2:46-50). Right after this it is said that Jesus was subject to Mary and Joseph, and returned with them to their home in Nazareth, but that Mary “kept all these things in her heart.” All parents must go through that time when their child begins to remove himself from them, and see about his business. The fact is that children are not our own; they are on loan to us from the Lord. Children are born to us, to be sure, and they are our very own to care for, nurture, protect and instruct, until they wax strong and wise. But the goal and purpose of all our efforts as parents is that each child is free to become an angel of heaven, a child of God, with one true heavenly Father, the Lord Jesus Christ. The Lord did not belong to Joseph and Mary. They knew this from the start, because the angel had told them that that which was conceived in her was of the Holy Spirit, to be called the Son of God. But they did not fully understand the process of His growth, His advancement toward the Divine, His glorification. They cared for Him as loving parents until He was grown in stature and wisdom, in favor with God and men, when they could recognize Him as the Master, the Son of God among men. Parents today must be aware that all children are the Lord’s. Mothers and fathers do not fully understand the growth process either, the advancement of an infant toward adulthood and finally to angelic wisdom. As the season changes, and we turn our thoughts to family, to feelings of innocence inspired by the image of the infant Lord, we who are parents can be grateful for the loan of our children, for the opportunity to raise them to the best of our ability to seek their true Father and mother, and so become angels of heaven. And we who are children can be grateful for the loan of our parents, who protected us, taught us right from wrong, steered us onto the right path, and loved us as their own. Then He went down with them and came to Nazareth, and was subject to them, but His mother kept all these things in her heart. And Jesus increased in wisdom and stature, and in favor with God and men (Luke 2:51,52). That a sphere of innocence flows into infants, and through them into their parents, and affects them. That infants are innocences is known, but that their innocence inflows from the Lord is not known. It inflows from the Lord because, as said just above, He is Innocence itself, and nothing can inflow, because nothing is possible, save from its beginning which is the thing Itself. The nature of the innocence of infancy which affects parents shall be told in a few words. It shines forth from their face, from some of their gestures and from their earliest speech, and affects their parents. They have innocence because they do not think from their interior, for they do not yet know what is good and evil and true and false, from which to think. Hence they have no prudence from proprium, nor any purpose from deliberation, and so have no evil end in view. They have no proprium acquired from the love of self and the world. They do not attribute anything to themselves. Everything which they receive they ascribe to their parents. They are content with the little things given them as presents. They have no care as to food and clothing, nor any as to the future. They do not look to the world or desire many things therefrom. They love their parents, their nurses, and their infant companions with whom they play in innocence. They suffer themselves to be led. They listen and obey. Such is the innocence of infancy which is the cause of the love called storg‚. God assumed the Human in accordance with His Divine Order. In the section that treats of the Divine omnipotence and omniscience it has been shown that God introduced order into the universe and into each and all things of it at the time of their creation, and therefore His omnipotence in the universe and in each and all things of it proceeds and operates in accordance with the laws of His order. Since, then, it was God who descended, and since He is order itself, it was necessary, if He was to become man actually, that He should be conceived, carried in the womb, born, educated, acquire knowledges gradually, and thereby be introduced into intelligence and wisdom. In respect to His Human He was, for this reason, an infant like other infants, a boy like other boys, and so on, with the sole difference that this development was accomplished in Him more quickly, more fully, and more perfectly than in others. That this development was in accordance with order is evident from these words in Luke: “And the child Jesus grew and waxed strong in spirit. And Jesus advanced in wisdom, and in the stages of life, and in favor with God and man” (2:40, 52). That this was done more quickly, more fully, and more perfectly than with others is evident from what is said of Him in the same gospel, that when He was twelve years old He sat in the temple in the midst of the doctors and taught them and that all that heard Him were astonished at His understanding and answers (2:46, 47; and afterwards, 4:16-22, 32). This took place because Divine order requires that man should prepare himself for the reception of God; and in proportion as he prepares himself, God enters into him as into His dwelling-place and home; and this preparation is effected by means of knowledges respecting God and the spiritual things pertaining to the church, and thus by means of intelligence and wisdom. For it is a law of order that in proportion as man approaches and gets near to God (which he must do wholly as if of himself) does God approach and get near to man and conjoin Himself with man in man’s interiors. It was in accordance with this order that the Lord progressed even to a oneness with His Father, as will be further shown in what follows.